Although Sonnet told me their Duet (Dual G4/500) would not work (per my PR contact there earlier this year), a reader named Flemming sent photos of his modified Cube running a Dual G4/450 module. I have been surfing your site numerous times - it's a fine job you do. It might be of your interest that I run a Dual 450 mhz Cube - upgraded totally on own. I took a Dual 450 mhz processor from a desktop G4 and took off and replaced a few components and I then managed to put it in my Cube. I also had to add some extra alu-plates in order to have full contact between the two processors and the cooling-plate. But it seems to work now - temperature is between 40 and 56 degrees celsius - fully acceptable ! I also added a new harddrive, extra RAM and a different videocard - but all standard spareparts. I now just need to find a tool to benchmark-test it under Mac OS X - but it seems really fast already. CD-ripping went up from max 7x to max 12x. Do you know of any tools by the way ? Flemming K. aka Kokio "
The inducator/coil was tinmelted (I hope that's the right english word ;-)) [unsoldered] off and replaced "lying down" and doing that I had to tinmelt a little piece of extra wire - because as you see it is placed beside the CPU module. Besides that two plates of aluminum was made - app. 20 x 20 mm - each 2 mm thick. A friend of mine - working with cooling/heating for the foodprocessing industry - measured and made the plates for me. I just attached the alum plates with - a little - thermal adhesive between both heatsink/new aluplates and between CPU/new aluplates. I've posted some of the photos he sent below, showing various phases of the mods. 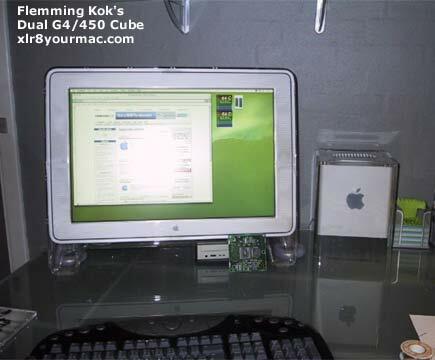 (I've asked how he attached the contact block to the heatsink (i.e. thermal adhesive, etc. rather than just a friction fit I assume). Flemming also sent photos of adding a fan/heatsink to the original Rage128 graphics card but to save bandwidth I've not posted these yet. 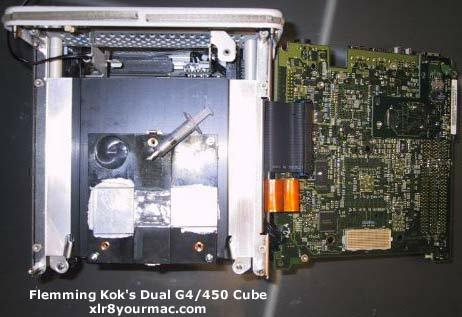 Here's a photo of the Apple Single vs Dual G4 CPU module from a G4 Tower dual G4 cpu module swap guide.
" 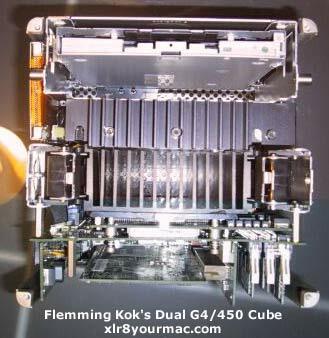 One thing that the dual g4 cube owner may want to consider is installing an 80mm fan in the bottom of the cube case (there are mounts and space for an 80mm IIRC). A 19.5 CFM @ 15 dBa 80mm is $20 from Plycon.com. Since the heatsink setup is optimized for passive cooling, I believe that forcing air over it should only improve it's cooling ability. (also the air coming out of the vent should keep papers from resting on it). Just a possible future upgrade, to lengthen the life of a really awesome cube. After posting a note about the ability to mount an 80mm fan in the cube, a reader sent a comment about sources of low-noise fans (some of the past articles also list sources). Being the owner of an Old Power Computing PowerCenter I have been taking steps to make it more silent. If something was bad about the old PowerComputing machines was that they were not very silent. Doing some research on fans I found a very silent one from Zalman zalman.co.kr. The 80 mm fan comes with a resistor making it possible to run at lower rpms and even more silent (20 dB, according to Zalman). The result was almost stunning, I went from being disturbed by the fans to be concerned about the silent IBM drive that was almost impossible to hear over the fans before. Such a fan at the lower rpm setting should be ideal for a Cube user. Thought it might be of interest. I welcome other Cube owner reports dual CPU mods or other customizations.